Chant, text, translation, source readings and reflections …. atah n’fachtaH bi, and You made it live within me [breathed it into me]. v’atah atid lit’laH mimeni ul’hachaziraH bi leatid lavo. and/but one day, You will take it from me and restore it in the time to come. adon kol ha-n’shamot. the Master Craftsman of every soul. Baruch atah Adonai, ha-machazir n’shamot ha-meitim. Blessed are You God, giving souls to the dead / who restores souls to dead corpses’. What is a ‘living soul’ [nefesh chayah]? Torah tells us that it is made of what is seen, and what is unseen – of adamah ‘earth’ and n’shamah ‘the breath of God’. a) Place a hand on your chest (and, if you like, the other on your belly). Take a “it’s great to be alive!” breath. Notice how your feelings – physical and emotional – change with each new type of breath. Our feelings influence our breathing, and our breathing also influences how we feel. c) Dropping your hands to your sides, allow a third breath: “I allow a deep down breath into and out of all of myself.” Feel it flow to all parts of yourself. Feel yourself being breathed. You don’t have to ‘do’ anything – just notice yourself breathing. Allow several of the third kind of breath. On each exhalation, allow a relaxed sigh through a ‘hah’. Don’t push the sound; simply notice what emerges when you allow this very deep, relaxing breath. If you notice tensions or blocks, don’t fight them or try to change anything. Just notice, and think ‘Ah, so that’s going on’, and continue to breathe. Return to these three breaths as often as you like – they can be very centring. 4. What is a soul? “The lamp [ner] of the Lord is the soul [n’shamah] of a person, searching all the deepest recesses of the innermost parts [vaten].” (Prov. 20:27) Vaten ‘belly’ was considered the seat of the mental faculties, also a womb ie where new life is first formed, and by extension, the innermost part of anything. While this verse is not easy to interpret, it does suggest that whatever it is we call ‘soul’ is both connection with and emanation from What / Who continually creates and sustains us. Lakish created this teaching by creatively reframing the phrase shavat vayinafash. First, he interpreted shavat as ‘ceasing’ to observe the Sabbath. Second, he divided the word vayinafash into two words: vav-yud ‘woe’ and nun-peh-shin, ‘soul’. There is a common misunderstanding of this teaching. Many read n’shamah yeterah as meaning ‘an extra soul’, when if fact it means ‘extra (ie additional) soul’; in other words, our soul is strengthened through the period of Shabbat rest and joy. 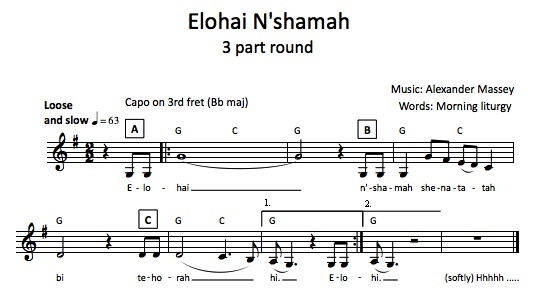 Elohai – the opening leap takes us from ‘earth’ (key note) to ‘heaven’, lowest to highest (and I enjoy the syllable ‘-hai’ being on the ‘high’ note…). Movement: scoop hands at the front of body upwards from near the knees to above the head. n’shamahis on the lowest note because the soul is located in an earthly being. Movement: drop hands down near the knees again. 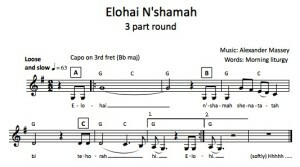 shenatata bi – a downwards musical shape, imagining the soul is given by God in heaven ‘downwards’ into a person. Movement: shenatata – hands descend slowly to chest height; bi – bring hands to lay gently over the chest. t’horah hi – t’horah ‘pure’ is at the same pitch as ‘me’ (bi), connecting these two ideas; and the tune finishes back on the ‘earth’ keynote where it started, with the soul now breathed into the person who is giving thanks for it. Movement: hands move forwards, away from the chest, to lovingly cup the invisible soul. When the chant is done as a 3 part round, the movements of the 3 groups create a lovely wave motion around the room. I like including movement in this, because the full prayer is as much about the body as the soul – it talks of God breathing into us, and of our physical earthly life being sustained by this breath-soul. Judaism teaches that a human is indivisibly soul and body (see section 9).